Feel free to forward copies of this E-Newsletter to your friends or someone who can use this information. Authorities in Southern California were led on a wild pursuit in East Los Angeles on Tuesday that ended when the driver took a surprise detour into a subway tunnel. The police pursuit began in Huntington Park, located south of downtown Los Angeles, after authorities spotted a pickup truck that had been reported stolen, according to KTLA. During the chase, captured by television news helicopters, the driver of the pickup truck slammed into a yellow taxi at one point and then kept driving. A garbage truck involved in a fatal Amtrak accident late last month had entered a grade crossing after the warning gates were lowered, the National Transportation Safety Board (NTSB) announced yesterday. On Jan. 31, an Amtrak train struck a garbage truck that was stopped at the crossing in Crozet, Virginia. The train was carrying Republican members of Congress on their way to a legislative retreat in West Virginia. As a result of the crash, one truck passenger died; another truck passenger sustained serious injuries and the truck’s driver sustained minor injuries. In the Central Valley, the San Joaquin corridor of Amtrak is operated by Caltrans and the San Joaquin Joint Powers Authority. Matt Rocco, with Caltrans, says they will probably meet the deadline for getting positive train control functioning. There has been a great deal of media attention on Amtrak and its fatal accidents that have happen in the last few years. These accidents were preventable and should never have happened. But fatal accidents still happen all the time often for no other reason than human error. Passenger train crashes often look terrible and invoke strong emotions with the public. An article in USA Today published on May 13, 2015 gave perspective of the level of dangers to passengers riding on Amtrak. This article pointed out that 158 Amtrak passengers died between 1975 to 2015. That’s an average of roughly 4 passenger deaths a year during this time. Several of these deaths were from passengers falling or jumping off from moving trains. This USA Today article also pointed out that during this time period between 1975 to 2015, Amtrak was involved with a total of 3,744 deaths. Just 4% of these deaths were with passengers. This article published in 2015 pointed out that for 2014 of 119 Amtrak related deaths, 108 were from people trespassing on the tracks. In New York City, property owners are responsible for repairing and repaving the adjacent sidewalks, and the city gives out violations to owners who don’t. “This is Amtrak’s property. Take responsibility for it and make sure that you keep our residents safe as you’re passing through our neighborhoods,” City Councilman Costa Constantinides, of Queens, told Bauman. The national railroad, which owns Penn Station and has come under fire over its deteriorated condition, began work at the beginning of January focusing on Track 15 — part of a series of infrastructure renovations at the aging rail hub. The project included demolishing and replacing a section of concrete. “We completed the track work within budget, safely, and with minimal amount of disruption to service, as committed,” Amtrak said in a statement, noting the the work was completed three days ahead of schedule. Anderson spoke at a House of Representatives subcommittee hearing on the slow-paced implementation of positive train control (PTC), a crash-prevention technology which, under federal law, must be installed on some 60,000 miles of the nation’s rail routes by year’s end. He was addressing safety concerns in the aftermath of several fatal accidents that the Amtrak system has witnessed since December. According to reports from Union Pacific, 99.7 percent of PTC hardware had been installed as of Dec. 31, 2017, on the company’s routes — including through Reno — and on 98 percent of its locomotives. Those lines are in the testing phase. Other lines are expected to have PTC systems installed before the deadline. None of the above has even the slightest shred of truth. Some of it is an outright, bald-faced lie. So what’s the purpose of Denham’s pontificating on PTC? Off the rails: What’s going on with all these deadly train crashes? “I’m not sure we’re seeing so many accidents and derailments, we’re seeing a couple that are getting a lot of press,” said Allan Zarembski, the director of the Railroad Engineering and Safety Program at the University of Delaware. And, despite the high-profile accidents, there has been no dip in train travel, with only a 4 percent dip in travelers over the last decade, according to the FRA. In a letter addressed to Governor Phil Bryant from Coast lawmakers, the plan calls for Amtrak service to be added from New Orleans to Mobile with stops in Bay St. Louis, Gulfport, Biloxi and Pascagoula. This proposal does not offer service to Jacksonville, FL. Knox Ross with the Southern Rail Commission said the shorter route gives passenger rail service a better chance of becoming a reality sooner. The Amtrak® Pacific Surfliner® recently launched the California Everyday Discounts program, offering year-round savings on train travel for seniors, students, and passengers with disabilities. The Pacific Surfliner route serves San Diego, Orange County, Los Angeles, Ventura, Santa Barbara, and San Luis Obispo, connecting nearly 3 million passengers a year to many of Southern California’s top destinations. 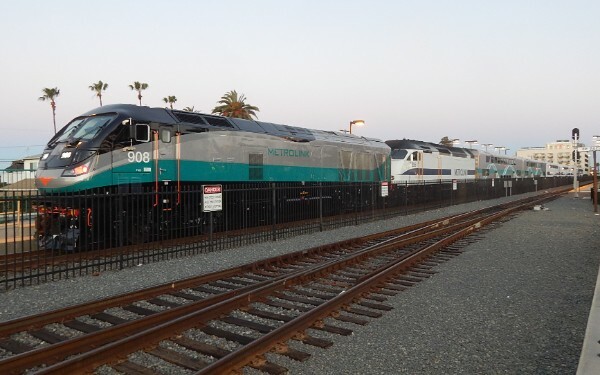 SANTA BARBARA, Calif. – A long-awaited commuter service involving a precisely timed Amtrak Pacific Surfliner will begin April 2 between Ventura and Santa Barbara Counties. The demand has been high for traffic relief for years. The recent disasters, which left the area with a transit mess and broken bridges on Highway 192, has resulted in extreme congestion during peak hours. An estimated 15,000 vehicles are using that route daily for work. 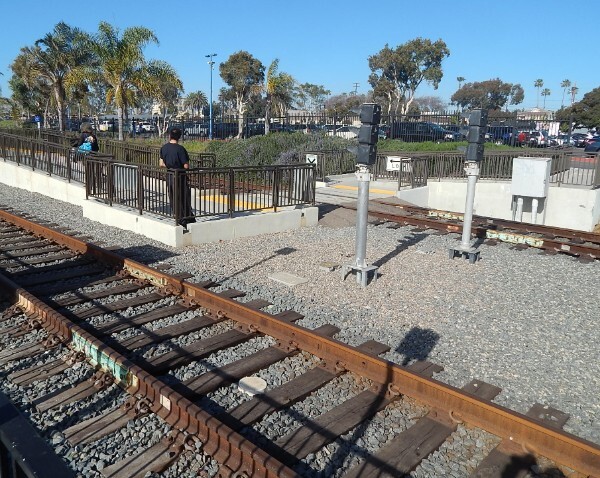 The planned train will have stops in Camarillo, Oxnard, Ventura, Carpinteria, Santa Barbara and Goleta. Chicago’s commuter rail agency is bargain-hunting as it looks to buy used locomotives to help bolster its motive power fleet. On Feb. 21 Metra directors authorized negotiations to purchase as many as 21 locomotives at a cost of $1.3 million each that were most recently used by Amtrak in California and other West Coast lines. Metra is also seeking proposals from manufacturers for new locomotives, for delivery in late 2020. As the status quo will not hold much longer for Amtrak, let alone the Northeast Corridor (NEC), a new paradigm is desperately required. Having no transparency on data and finances provided by Amtrak plays into its “shell game” that prevents a logical paper trail to audit how the long distance routes funding is bled off to cover the widening fiscal hole of the NEC. Concomitantly, how much, if not every dollar paid by the non-NEC states is turned around to support the NEC? For how long has Amtrak manipulated such finances to dump the NEC’s overhead and infrastructure costs into the long distance and state-supported sectors? In Silicon Valley, work is now starting on geotechnical analysis of proposed track alignments in Santa Clara County and in the City of San Jose. A crew on President’s Day was busy drilling for core samples along busy Monterey Road, just south of Senter Road. The samples will help planners to understand soil conditions before proceeding with advanced engineering and environmental work. BAKERSFIELD, Calif. – Work on the California’s High Speed Rail is coming to Kern County Tuesday. Construction work will cause some closures in Wasco. The High Speed Rail Authority says eastbound shoulders on Pond Road will close between Magnolia and Palm avenues on Tuesday. The California High-Speed Rail Authority announced the closure of H Street between the Stanislaus Street bridge and Divisadero Street for utility relocation. Work is scheduled to start next Monday, February 26th and will last approximately two months. The meeting, which is set for March 6 from 7 a.m. to 9 a.m. at the Hanford Fraternal Hall, will also include design, right of way information and discussion of small business and employment opportunities. Construction Package 2-3 (CP 2-3) is the second design-build construction contract executed on the high-speed rail program. CP 2-3 is the 65-mile segment between East American Avenue in Fresno County to one mile north of the Tulare-Kern County line. It will include approximately 36 grade separations in the counties of Fresno, Tulare and Kings, including viaducts, underpasses and overpasses. The ‘train deniers’ are wrong. We Californians love riding the rails. If California’s train deniers are right — that no one ever rides trains here, that Californians prefer to drive or fly, and that high-speed rail is a boondoggle that won’t attract riders — then how do you explain my wife’s public humiliation?.. The Pacific Surfliner that day was mobbed, with every seat taken and passengers standing in the aisles and stairwells. So when I took those two hungry boys in the direction of the café car, the crowds were so thick I couldn’t squeeze through. The boys, now nine and seven, are very skinny and insisted on continuing on, despite my pleas, beginning a memorable adventure. Regarding “Progress vs. preservation” (Page A1, Sunday), it’s not surprising that farmers, townspeople and local leaders between Houston and Dallas are opposed to the Texas Central bullet train. This in spite of the fact that the high speed line will be elevated along most of its right-of-way and the trains will travel in virtual silence as opposed to the existing freight lines that cross many of their properties at grade and produce noise at any hour of the day. The claim that it will interfere with their way of life simply reflects the trait all of us have in common – fear of the unknown. When I lived in Germany, the construction of high speed rail – which now offers the preferred means of transportation for many travelers throughout Europe – was in its infancy. Farmers and rural townspeople were suspicious of what effects it might have on them. But now, years later, they have come to realize that high-speed rail has had no effect on their lives. They and their livestock are totally unaffected by the trains that glide through their pastures and near their towns. The trains are not only transforming Chinese economy and travel but are also starting to chip away at oil use in the world’s second largest consumer and biggest source of fuel demand growth. The impact is being felt primarily on jet fuel and gasoline consumption. The trains, running at roughly 200-350 km/hour, provide an economical and often more reliable alternative to air travel. State-owned oil giant China National Petroleum Corporation recently cited HSR among a host of changes including electric cars and the sharing economy as factors crimping Chinese gasoline demand growth. But while air transport dominates the long-haul travelling market, on shorter distances, more and more passengers seem to be inclined to opt for the train instead. Bloomberg analysis has recently shown that, on key routes in Asia and Europe, high-speed railways (HSR) and air travel are neck and neck. The reasons are quite easy to grasp. Firstly, when taking into consideration what flying entails – travelling from home to the airport, time spent in check-in and security, as well as additional transport and baggage pickup– taking the train offers big overall travel time savings. The rail line – which has been under construction for years – would halve the arduous, traffic-congested route to a speedy 28 minutes between the two cities. The SCIG will create a railhead for container traffic in Wilmington just four miles from the Port of Los Angeles, rather than boxes having to be drayed 24 miles on local roads and the 710 freeway to downtown rail facilities. BNSF has said SCIG will allow 1.5 million more containers to move by more efficient and environmentally preferred rail through the Alameda Corridor each year, reducing truck traffic congestion in Southern California, while also creating jobs. But the city of Long Beach, air pollution regulators, environmentalists and neighbors objected, contending in 2013 lawsuits that the 185-acre yard would actually make air quality worse. They want further work done on the environmental reports needed for approval, which the city of Los Angeles granted in 2013. For nearly a decade, Palo Alto’s elected leaders and residents have advocated for construction of underground rail tracks to accommodate California’s high-speed rail system and Caltrain, which is planning to add more trains as part of its electrification project. But with a new study highlighting the high costs and steep engineering challenges of the project, city officials are preparing to pull the plug on the idea and to consider less ambitious and less costly methods for separating the train tracks from the city’s roadways. From samTrans: Did you know that more people ride Caltrain daily than live in Greenland? Did you know that Abraham Lincoln was President when the railroad began carrying riders 150 years ago? Interesting facts like these are all part of Caltrain’s new “Did You Know?” public education campaign, which kicked off Sunday, Feb. 19. Caltrain last week began construction to improve three grade crossings in Redwood City, California. Crews are installing new pedestrian gate arms, as well as new guard rails and signage to channel pedestrians toward crosswalks. Workers also will install roadway markers and bumps along the crosswalk so vehicles don’t accidentally turn onto the tracks, Caltrain officials said in a press release. In the latest volley in the battle between Atherton and Caltrain over the height of the poles it plans to install as part of its project to electrify its trains, Caltrain has given the town until Feb. 28 to meet a list of demands if it wants shorter poles installed. A Feb. 6 letter from Caltrain demands that Atherton pay it $200,000, get written consent of property owners whose trees will be affected by changed plans, and agree the town won’t support or be a part of any lawsuit filed against the electrification project. In return, Caltrain would install 10 35-foot-tall poles with crossbeams spanning only one set of tracks, instead of the five 45-foot-tall poles that cantilever over two sets of tracks it had planned. It looks like another swing and a miss for the Oakland A’s in their quest for a new ballpark near downtown. BART has said it cannot build a station at the Howard Terminal site the A’s have eyed for their new stadium. BART officials said a station at the site, just north of Jack London Square, would be too disruptive to its service and would take too long to design and build. 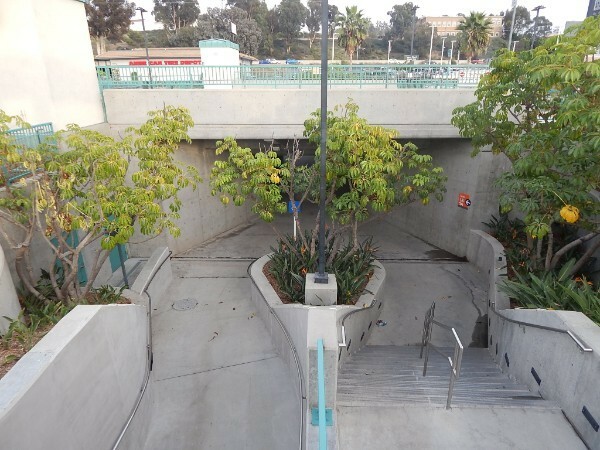 Feb. 21–A new BART tunnel beneath the bay might begin in Alameda and emerge in Mission Bay. It could parallel the existing tube but then head up Mission Street on the west side of the bay instead of up Market. Or maybe it would stretch between Alameda and AT&T Park. No one knows, but after years of supposition and pie-in-the-sky conjecture from planners and passengers alike, BART officials are starting to study a second Transbay Tube. Over the last year BART employees have been kicked, punched, shoved, spat upon and pelted with rocks while on the job. More than 40 incidents of battery targeted at the public transit agency’s staff were reported in 2017, according to crime data obtained by SFGATE. The number of assaults has increased steadily year-over-year since 2013, with the figure nearly doubling between 2015 and 2016, and that’s just the reported incidents. As part of Measure RR and its $3.5 billion investments in expanding capacity, BART is planning to test out platform “screen doors” at the 12th Street BART Station. Screen doors, as seen in the photo above of the Paris Metro, are a set of safety doors, placed along the edge of the platform, intended to prevent transit riders from getting onto the tracks. BART is allotting $3 million of Measure RR money to this pilot. When BART receives reports of earthquakes, it stops trains until it can get information from the Geological Survey. If the magnitude is lower than 3.0, trains can start running under automatic controls. If it’s higher than 3.0, operators run trains at low speeds, under manual control, for about five minutes while conducting visual track inspections. A 2.8 earthquake at 12:21 p.m. caused BART to halt trains briefly, transit officials said. A 5:53 a.m. quake also led to a 10-minute delay that affected the morning commute. Palo Alto officials say a pending state bill would strip their control of land uses in the city and possibly result in exceptionally tall housing developments along high-transit areas. State Sen. Scott Wiener, D-San Francisco, last month introduced State Bill 827, which aims to boost housing density in and near transit corridors. If passed in its current form, the bill would allow buildings that include housing units to be as tall as 85 feet within a quarter-mile of busy transit corridors where buses stop at least every 15 minutes during peak commute hours, or within one block of a major transit stop, such as Palo Alto’s two Caltrain stations. California is in the midst of crippling housing crisis. The state’s population has steadily grown, but it hasn’t been building new places for people to live at anything close to the same rate. It now ranks 49th in housing units per capita. The predictable consequence of demand growing faster than supply is that existing housing in the state, especially in its biggest cities, has become insanely expensive. Seven of the 10 most expensive US real estate markets are Californian. The median home price in the state is $524,000; in San Francisco it is approaching $1.3 million. But those legislative reforms are fighting against an artificially constrained market. The basic problem remains: It is difficult to build housing in California, thanks in part to a thicket of local parking regulations, building requirements, zoning restrictions, and bureaucratic choke points. The state’s (generally whiter, wealthier) residents use these tools to prevent new construction that might house (generally more diverse, poorer) newcomers. Germany’s latest, and more radical, plans are similarly supposed to solve the lingering problem of air pollution in German cities, which recently prompted the threat of major E.U. fines. More than 130 cities in Europe are affected by “life-threatening” air pollution, according to the European Commission, that is believed to be responsible for about 400,000 deaths each year in the European Union. And even though Germany is far from being Europe’s most polluted nation, the topic is taken more seriously here than in most other places that have repeatedly breached E.U. limits on nitrogen dioxide and fine particles. Los Angeles County under the management of the Los Angeles County Metropolitan Transportation Authority, also known as LA Metro, has an ambitious and multi billion dollar plan to expand rail transit service in the county. As each new link is finished and connects to the rest of the transit system more people will be able to get around the county without dealing with jammed freeways or hunting for parking. There are 8 major rail projects LA Metro is planning to open between now and 2028. With construction expected to begin this year, Los Angeles World Airports has unveiled new renderings and an animated video that preview the LAX Automated People Mover. The APM, a monorail-like system, will operate along a 2.25-mile elevated guideway with six stops between the LAX Consolidated Rental Car Facility and the Central Terminal Area. Utility relocation and surveying for the APM are expected to begin in the second quarter of 2018, with construction of the guideway set to start as early as 2019. An upcoming change to state environmental rules might make it possible to speed up the frustratingly slow Expo Line. Giving cars the right of way has been one of the biggest challenges to making the light rail, which runsfrom Downtown Los Angeles to Santa Monica, faster. Instead of flying over or tunneling under intersections, especially between Western Avenue and Downtown, the train stops and waits for traffic to pass in front of it. Two of the six cities in the 12.3-mile path of the $1.5 billion Gold Line foothill extension are pursuing lawsuits against the construction authority, saying last-minute changes to the alignment, bridges and plans to acquire properties will cause permanent damage to their cities and are a violation of state environmental laws. The project, which is being built next to Metro’s Expo/Vermont Station by nonprofit developer Abode Communities, will feature interconnected one-to-five-story buildings featuring 140 apartments, 8,000 square feet of commercial space, and a landscaped courtyard area. Plans also call for a 114-car garage within the new development. Per the California State Treasurer’s office, the new apartments will come in one-, two- and three-bedroom floor plans, with rents ranging between $466 and $1,354 per month. The units will be targeted to households making between 30 and 60 percent of the Los Angeles area median income. Trammell Crow Company continues to move forward with plans for a mixed-use development near the Gold Line’s Sierra Madre Villa Station in Pasadena. The project, slated for an approximately 8.32-acre property at 3200 E. Foothill Boulevard, would replace a self-storage facility with eight mixed-use buildings featuring 550 apartment units, 9,800 square feet of retail space and parking for up to 782 vehicles. The mix of studio, one-, two- and three-bedroom dwellings would include 481 market rate units, as well as 23 units priced for moderate-income families and 46 units for low-income families. Everyone’s a little bit wrong here. And the argument is a bit of an academic one, filled with classic posturing. In Los Angeles County especially, what with the creation of the massive cash cow that is the Measure M 1 percent forever sales tax to fund Metro, rail and bus line building isn’t going away. It’s going to entirely change the transportation infrastructure of the populous core of our region over the next 30 years. If the sprawlers are right and no one really wants to get out of their cars — and these same folks are the ones who say Southern Californians don’t want to live in multi-family buildings near transit-friendly development, so that what we really need is more exurban sprawl, with three-bedroom housing tracts filling in the wild gap from here to Joshua Tree — well, there’ll be some swell views of empty light-rail cars on lines from Sherman Oaks to Santa Monica from those new toll roads. Noel – As usual, you have put together another very informative compilation of relevant passenger rail and transit articles! Your efforts are appreciated because you always find articles some of us in the rail industry miss so thank you again for your focus and dedication to this resolve! You and Paul really speak out and don’t hesitate to point out critical issues, or things that are simply wrong. Keep up the great work!